What are the challenges for monetary policy & financial stability in Ukraine? 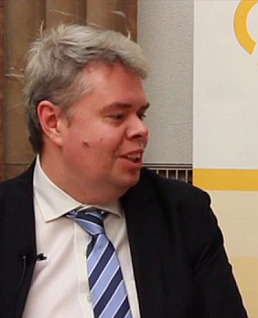 The Deputy Governor of the National Bank of Ukraine gave wiiw an interview. Here is the video. The video was conducted by wiiw Scientific Director Michael Landesmann on 28th February, shortly after the 78th East Jour Fixe of the Oesterreichische Nationalbank (in cooperation with wiiw), titled 'Ukraine - progress of reforms and challenges ahead'. Dmytro Sologub was born on June 8, 1978. In 2000 he graduated as an economist and a lecturer in Economics from the Belarusian State University, where he majored in Economic Theory. In 2002 he obtained Master's degree in Economics from the National University of “Kyiv-Mohyla Academy” (the EERC Master's Program in Economics). Fluent in English, Dmytro Sologub has done economic research studies. In 2013 he became a Certified Financial Analyst (CFA). In 2001-2002, Dmytro Sologub, while a postgraduate student at the university, worked as a research assistant for the EERC Master's Program in Economics at the National University of “Kyiv-Mohyla Academy”. From 2002 to 2004, he worked as a research scientist at the Institute for Economic Research and Policy Consulting, first in the public finances division and then in the macroeconomic analysis division. Between 2004 and 2007, he served as a research economist at the IMF Resident Representative Office in Ukraine. From 2007 till his appointment to the National Bank of Ukraine, he was the Head of Research Department at Raiffeisen Bank Aval JSC. From March 17, 2015 – Acting Deputy Governor of the National Bank of Ukraine, a member of the Board of the National Bank of Ukraine.